Are you tired of listening to your partner complain at night when he or she is trying to sleep but you’re catching up on the new season Stranger Things? Or perhaps you’d like to connect your TV to some awesome wireless speakers like these instead of a sound bar. 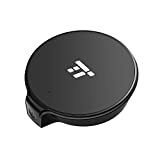 In either case, the TaoTronics 65ft Bluetooth Transmitter is exactly what you’re looking for. Connect it to the digital or analog audio-out ports on your TV and in seconds you’ll be streaming crystal-clear sound to any headphones or speakers you want. * Longer Usability Range: Up to 20m / 65 feet usage distance, Bluetooth transmitter offers more options as to where you entertain yourself. * Vast Compatibility for Versatile Usage: Bluetooth adapter features digital optical TOSLINK and 3.5mm / RCA port to stream audio from non-Bluetooth audio sources (such as TV, iPod, computers and more) to Bluetooth headphones or speakers. * Low Latency, Instant Sound: aptX & aptX Low Latency support enables users to enjoy high-quality audio in sync with the picture (Note: aptX Low Latency enabled Bluetooth headphones or speakers are also required). * Double the Sound, Double the Joy: Transmits audio to 2 Bluetooth headphones or speakers simultaneously for more immersive entertainment to share with a friend. * Extended Working Time & Fun: 15 hour working time and keeps working while being charged to ensure the recreation continues without interruptions.